FDA approved Gardasil 9: Malfeasance or Stupidity? By Norma Erickson Merck stated in the package insert, ”The proportions of adverse outcomes observed were consistent with pregnancy outcomes observed in the general population.” Unless they are talking about some country other than the United States, THIS IS NOT TRUE. According to the CDC’s latest publication on fetal mortality, the rate of spontaneous abortions and fetal deaths in the United States is 6.05/1,000 pregnancies or 0.605% – hardly 10.9%, much less 27.4%, and certainly not ’consistent with outcomes observed in the general population’ of the United States. 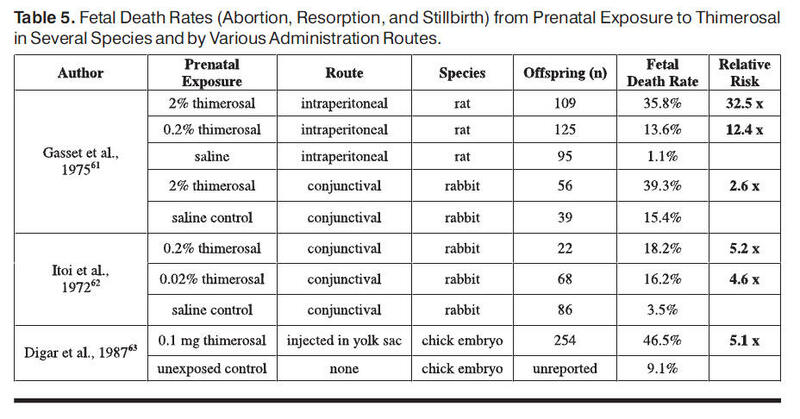 [2009 Nov] Misrepresenting smallpox vaccine in pregnancy findings by Meryl Nass, M.D Last April I wrote a detailed critique in this blog of a paper by Margaret A. K. Ryan et al on anthrax vaccinations in pregnancy and birth defects. In the paper I am discussing today, Evaluation of Preterm Births and Birth Defects in Liveborn Infants of US Military Women Who Received Smallpox Vaccine, Ryan has studied birth defects in military servicewomen who received smallpox vaccine during pregnancy. In fact, there is likely significant overlap between the two groups of women Ryan studied, since both anthrax and smallpox vaccines have been given to all service members deploying to Iraq, Afghanistan and Korea since 2003. The findings of the two studies are, no surprise, very similar: women receiving smallpox vaccine during the first trimester of pregnancy had a rate of major birth defects in their offspring of 4.5%, while the offspring of women vaccinated post-pregnancy had a major birth defect rate of only 3.2%. The birth defect rate is therefore 40% higher if the mother was vaccinated during the first trimester. What would a true scientist have done with these results? [2009 April] Comments on: Ryan, MAK, et al. Birth Defects among Infants Born to Women Who Received Anthrax Vaccine in Pregnancy. American Journal of Epidemiology; July 2008. by Meryl Nass, M.D Dr. Ryan presented results of a subset of this group (those vaccinated 1998 through mid 2001) in late 2001 and early 2002. Shortly after her presentation to FDA, in January 2002 FDA changed the pregnancy warning on the anthrax vaccine label to category D from C, indicating that data showed the vaccine was associated with birth defects, and should not be given to women during pregnancy. The Assistant Secretary of Defense for Health Affairs, Dr. William Winkenwerder, also responded to Dr. Ryan's findings. He sent memos to all the military services, directing that special efforts should be made to avoid giving the vaccine during pregnancy, including the use of pregnancy tests if appropriate.